Have you played the previous parts of the game? Well, in that case you know what to do. 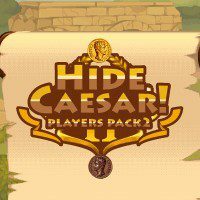 Hide good Caesar and remove the bad one! Are you ready to save Caesar and become the part of the story? Show some courage and prevent the attack on him. Drop figures and cover Caesar, so the falling stones won't deal damage to him. However, there is a bad Caesar you should remove before the level ends. Can you do that? Think of the best way to complete the level by using things you currently have.